Samsung offered its latest Note 4 with two processing chips options. It was powered by Samsung’s in-house 64-bit Exynos 7 and California-based Qualcomm’s Snapdragon 805. The octa-core Exynos 7 receive some stellar reviews especially in the battery department, however, Snapdragon 805 was no far behind anyway. Latest leak suggests that Korean tech giant is actually working on a third variant of the Note 4 possibly powering it with 64-bit Qualcomm Snapdragon 810. Both the Qualcomm and Exynos SoCs have their own ups and downs having marginal overall performance differences. However, the upcoming Snapdragon 810 will probably take the performance a little higher. We earlier heard about Qualcomm facing some serious concerns with the production of octa core Snapdragon 810 including video driver issues and RAM management. However, yesterday Qualcomm claimed that the production of Snapdragon 810 is indeed on track while refusing to comment on the earlier leaked issues giving some clouded confirmation to the tech world. It is yet to be seen how long it takes Samsung to fit the much raved-about processor in its beautiful Note. Our sources have revealed to us that a new variant of the Galaxy Note 4 with a Snapdragon 810 SoC is being tested for some major carriers in South Korea. These carriers might be LG+, SKT, and Olleh, but we are not too sure about the names. Snapdragon 810 is a 64-bit based processing chip with the big.LITTLE technology taking the most out of each configuration of cores with the “4big plus 4little” configuration. Qualcomm is calling this chip as its fastest ever. 810 has Cat 6/7 on board with the 20 Mhz exaggeration capability to achieve 300MHz down link speeds. 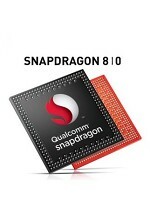 Qualcomm Snapdragon 810 gets the slightly upgraded Adreno 430 GPU. Chip supports two 4K displays at 30 fps.